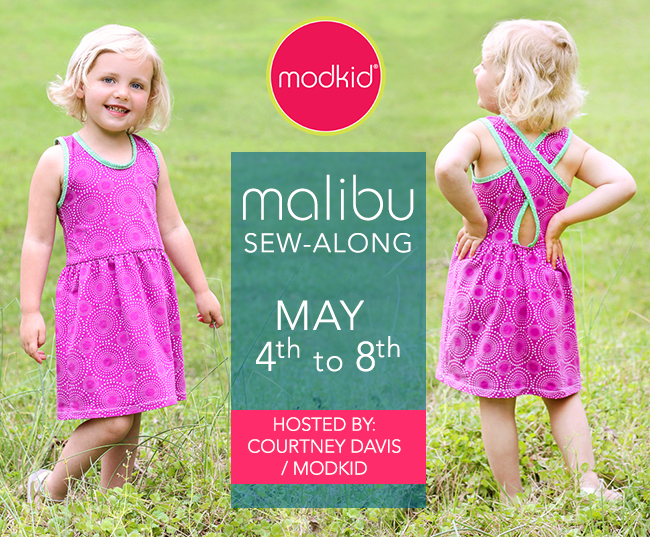 The final day of the Malibu sew-along has arrived! Let's wrap things up!! With the skirt wrong side out and the bodice right side out, slide the bodice inside the skirt and pin right sides together. Don't let the photo above confuse you! I flipped everything out to show you how close the back pieces should be when the bodice is pinned in place. The space between the back bodice pieces should be 1". All raw edges and side seams should be aligned. Stitch the skirt to the bodice with a wide zig-zag stitch over the elastic. You will need to stretch the elastic to fit the bodice as you sew, but do not stretch the bodice fabric. Turn the dress right sides out. Fold the area between the cross-back pieces to the wrong side encasing the elastic. Using a wide zig-zag stitch, sew the folded section down just between the back bodice pieces. Hem the dress using your favorite method. Be sure to check out our favorite knit hemming tips! Here, I used washable hem tape to help with pressing a crisp edge and a twin stretch needle. We can't wait to see your finished product!! Be sure to add your photos of your completed Malibu to our Facebook Group before Monday, May 11th to be entered to win one of the prizes. You can share photos on Facebook and Instagram with hashtag #malibusewalong. We will post the winners next week!